Embedded chip maker Marvell had a surprisingly large presence at CES 2010, but a visit to its stand soon revealed why - it's got a lot to talk about. What caught our eye were its ARM based SoCs, which look like giving the likes of Qualcomm, NVIDIA and Broadcom a run for their money. The most eye-catching of all was the announcement that Marvell has developed a quad-core processor based on the ARM instruction set. Like Qualcomm, it seem to have done the rest of the architecture design itself, and has not had to license ARM's Cortex A9 design, which appears, for example, in NVIDIA's second generation Tegra SoC. The quad-core chip doesn't seem to have a name yet, but it's derived from the same technology as Marvell's ARMADA 500 and 600 chips, and is heralded as a raising of the bar for ARM based processors, which are increasingly offering PC-like performance. Talking of ARMADA, Marvell also launched the 610, which it claims is the first application processor to bring 1080p encode and decode to mobile connected devices. 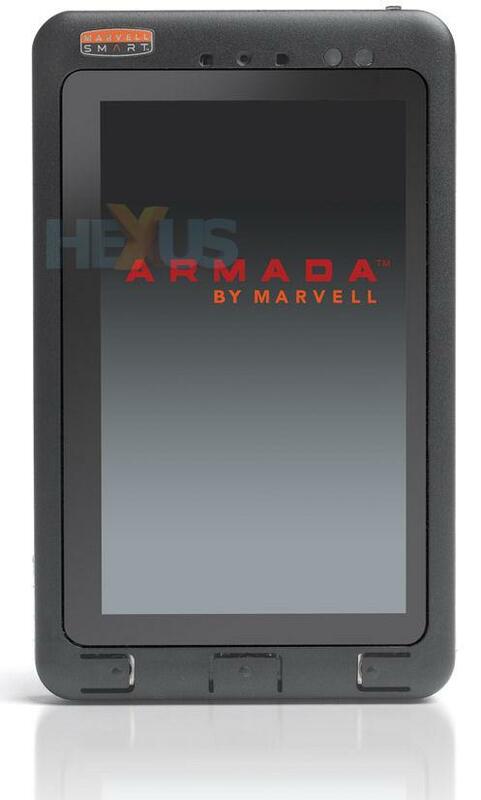 Here's an e-reader reference design Marvell was using to showcase the capabilities of the ARMADA 610, and it also announced a partnership with E Ink to bring designs like these to market soon, but running on the ARMADA 166E chip.